Find of the Week - Etruscan Urn Cover, 7th cc B.C | What is it worth? 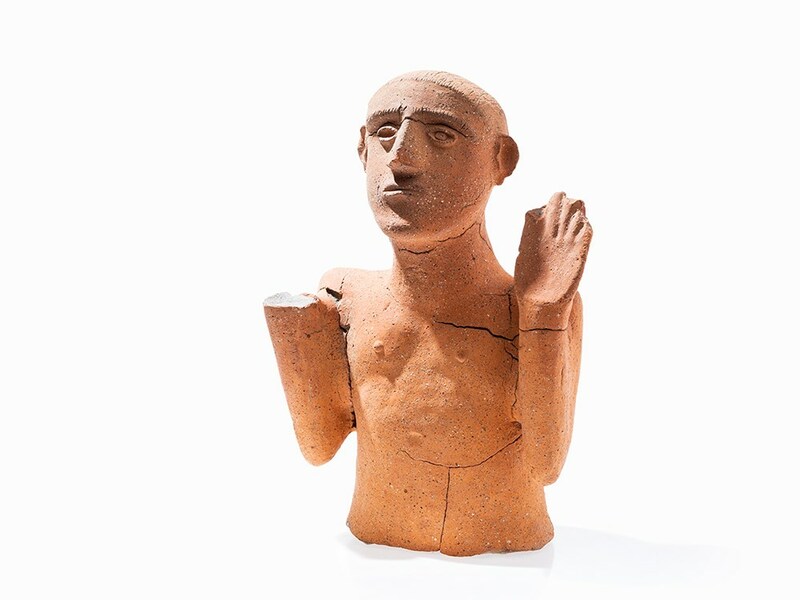 This Etruscan terracotta figure of a man dates back to the dawn of the Etruscan civilization around 7th century BC and served as an urn cover. The figure features the idealized upper body of the deceased in worship posture with hands raised. This figure is impressive with its significant size of 43 cm high, and the beautiful color of the terracotta. It is a part of the Art from Ancient Cultures & Tribes Auction at Auctionata, which takes place on August 16. The preoccupation of Etruscans with elaborate burials lead historians to assume they have a belief system similar to the Egyptians, which is based on the afterlife and the soul remaining with the body after death. Around the time this urn lid was made, c. 7th cc B.C., the Etruscans occupied the central region of Italy between the Arno and Tiber rivers, and eventually settled as far north as the Po River valley and as far south as Campania. They flourished until they were assimilated into the Roman culture by the end of the 2nd cc B.C.. Etruscan pottery was greatly influenced by the Ancient Greek style and the Orientalization (ca. 750–575B.C.) and Archaic periods (ca. 575–490 B.C.). The preoccupation of Etruscans with elaborate burials lead historians to assume they have a belief system similar to the Egyptians, which is based on the afterlife and the soul remaining with the body after death. However, just the opposite of Egyptians, their early grave sites show urns with the ash retained after the body was cremated.